Well hellooooooo, the sun is shining and I’m about to go down to my lovely blue studio and make some more beads for all you lovely people who come and support me, as of course you know it’s my next bead fair this coming Sunday 22nd July, at the South of England Centre in Ardingly, West Sussex, 10am to 4pm. More details on my events page. I’ve been trying to get the summer spirit by making some new beach beads and fish in the hope that the sun will come out, and am planning to make starfish and maybe a shell or two if I can come up with a design today. Actually it would help if I popped out and switched the kiln on to warm up first…….back in a mini mo…….that’s better. So this Sunday I will have my usual mix of glass bead sets and focal beads, with several new designs, silver chains, and my ever popular rummage pots, with bargains starting at £1. I’m working on some new didy sets (matching 2’s and 3’s) for all you earring lovers and I also have some new uncored Big Hole Bead sets, perfect for filling up your Pandora, Troll or other similar charm bracelet. I may even put more beads in my sale dish, who knows! Do come and say hi. Hello peeps. It’s a been a long time hasn’t it? I’ve been really busy over the last few months doing a City and Guilds course, and I’m now eagerly awaiting my letter to tell me I’ve passed. I was really surprised how long all the homework and class preparation took, especially towards the end of the course. Anyway, that’s over now, and I have got my life back, sort of. Horsham Open Studios started this weekend, and we have had a lovely first couple of days with so many visitors that we didn’t get time to eat lunch until 3:30pm on Saturday. Thank you to everyone who came this weekend, you made it really special for us, and we look forward to welcoming more of you next weekend. I have a cabinet full of colourful jewellery, with some new designs, lots of beads to choose from, my fun earrings (using sterling silver) and lots of big hole beads starting at just £3 each to put on your Pandora style bracelets (they don’t have silver in them). I also have other small bits and bobs to choose from, including my ever popular £1 rummage dish. Here’s a couple of photos to tease you. I have several new tuition dates listed on my tuition page. The next available date is a 1 day Beginners course, Weds 29th June, 10am to3pm. Special rate of £79, class size of 2. Contact me to book your place now. As always I have other availability if these dates do not suit, drop me a line for my list of dates to choose from. I have one new listing on Etsy and will be adding more during the day, just follow the link on the left. Big news today…….I have booked my space at the spring Big Bead Show at Sandown Park, Esher, Surrey, KT10 9AJ. This huge show is on Saturday 2nd April and is well worth a visit. I’d be resisting booking, but the lovely Maria at Bead magazine said she’d squeeze me in if I wanted to come. So here we are, all of a sudden getting revved up for the big one. It’s great news for my mojo as all of a sudden lots of ideas for new beads are flooding in at last. Long may it continue. I hope you will all come and see me here, I will have some free tickets up for grabs later too. Here’s a little sneaky peek at what I’ve been up to lately. At last I’ve had time to practice the skills I learnt last April at Flame Off with the hugely amusing and talented Sharon Peters, and have found some time to design some of my own characters. Here’s a green one…..
Valentines day has been and gone, and now we have the first half term of the new year upon us and Pancake day yet to come. We celebrated in style with a romantic candle lit dinner for 3 on Monday, which included using the chocolate fondue set I bought last year, and I made Nigella Lawson’s ‘Love Buns’ as a surprise. I couldn’t get the heart sprinkles she shows in the book but bought some red edible glitter to use instead. The theory is that I can use it for Christmas decorating too. The only downside was that the icing was rather sickly, so I think I’ll stick to making a royal icing with freshly squeezed lemon juice again like I did last Friday. I’m so into baking at the moment, which is rather unfortunate as I just want to eat everything I’ve made, so I have to pace myself somewhat. I really wish I didn’t like cakes and puddings so much, but I won’t be hypnotising myself to give them up, like I did with crisps last June….I haven’t eaten a single real crisp, which is no loss really….empty calories. I have yet more neads on Etsy (that should be beads, but well, maybe I should stick with neads as bead addicts need beads). I had another new set to put up for sale and went through the whole process until at the last moment I realised they were different from the photo I was using! I think Rick will have to do some more photography for me, especially as I have a real surprise of some really new beads that I’ve had in mind to make for ages and got my first chance to play with the designs this week. All will be unveiled later. I have another new tuition date, a Beginners 4 hour taster session on Thursday 10th March, 10am to 2pm. There is one place available on this course. Contact me now to book your place, and come and have a lesson making glass beads. Oh and here’s a photo of my Glitter Love Buns, I swirled in some red food colouring to some of the icing (I only made half the quantity and that was plenty), and unfortunately the whipped topping never set as it was supposed to. Yay, we have our glass! Photos below…..using the phone again. Fortunately my pieces were better than Ricks, I would have been gutted if they weren’t, but it’s not a competition and I did have the best position going last in all the exercises so I could learn from what the others did. Although it was obvious that my experience did help, being able to constantly turn the punty, knowing what sort of speed to turn it in response to how the molton glass was moving, and having a better feel for how much pressure to apply to the glass etc..I’m just itching to have another go now, it was so much fun, especially the bit where we took a gather, there was something rather special and exciting about dipping the punty into all that tremendously hot glass. It really was like collecting honey on a spoon or one of those ridged wooden honey handles, but VERY hot. hee hee. I have to admit the blowing part wasn’t my favourite bit, and that I really loved making the paperweight, I just wish I hadn’t gone for more blue powder and twisted it so much, or the colours would have been purer. It appears that the blue and yellow react in the same way that they do in a bead, by creating black/dark grey where they touch. Don’t forget that I have a couple of tuition dates available, one for this Friday 1st October, so if you fancy having a go making beads (in a much more accessible hot glass process) then don’t delay, and contact me now. 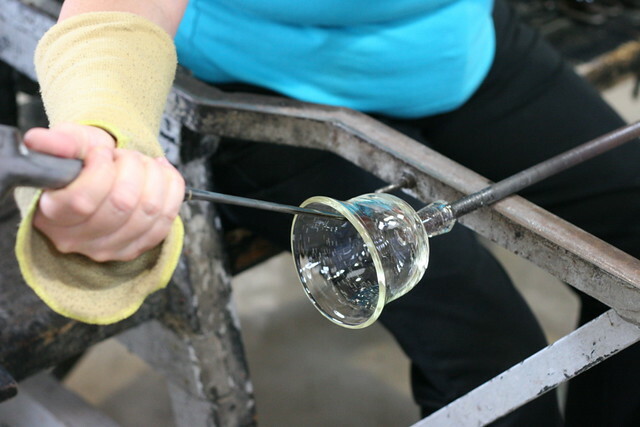 On this class we will be covering – using silver glass, dichroic glass, sparkly stuff , encasing, presses and shaping, long tubes and flame know-how – or as much as we can get through on this massive list in one day! Oh dear, I’m going to get lots of flack from Rick about these photos, apart from the fact that I haven’t shown his pieces, oh yes, these are all mine, different views. So the schools went back on Thursday, and this year we had the great pleasure of seeing our daughter start at Secondary school. She looked so smart in her new uniform that I was bursting with gooey feelings (very unlike me). After the obligatory photos on the doorstep in the same place as the ones we took when she was 5 and starting primary school, she was picked up by my friend. As we wandered back into the house after her departure we both groaned and panicked because in the excitement she’d not returned into the house to collect her brand spanking new gym kit. WOOPS. It was a very mad dash after several rushed phone calls to get her kit to her before she walked the final few minutes to school from her friend’s house. I’m not one to run around her but you seriously can’t start a new school without your gym kit and it was partly our fault. Of course going to big school means she starts earlier, as she has to be at school earlier and it’s further than the 3 minutes (literally) around the corner that we are used to. Which also means that she comes home later too. The upshot of this is that I get a bit more time to work during the day, and so far, even with 2 days under our belt, it seems to be making a difference. I made a record 99 beads on Thursday (a record for me anyway) and seem to be using the time productively so far. My other big news is that I had an ab fab weekend at Stourbridge last weekend. 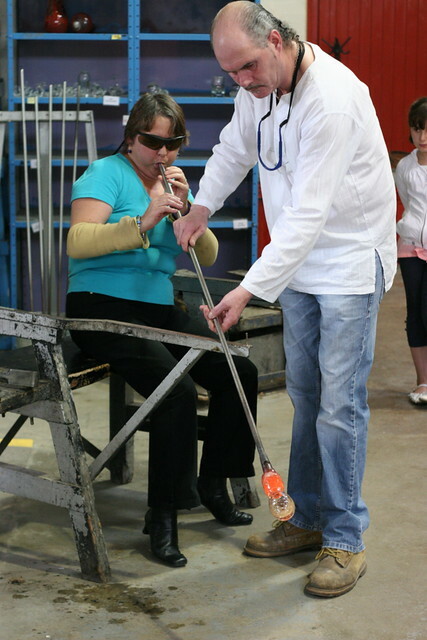 at the International Festival of Glass. We left last Friday and attended the Bead Fair on the Saturday and Sunday. We had an enjoyable meal out at the Chinese on Friday with friends, a very raucous meal at the Curry House on Saturday evening with more nutty glassy friends, and a quiet one with friends at the hotel we stayed at on Sunday. But the best part of the weekend (which was already super brill) had to be Monday, when Rick and I had a chance to try our hand at glass-blowing. I’d noticed that the taster session on Monday wasn’t full and amazingly when we enquired there were still 2 places on the 4 place course. So at 2pm after a very rushed lunch we entered Hot Shop no.1 and had the best time ever. The 4 of us took turns after being shown demo of what to do. We made a snowman to get us used to the basics, then swiftly moved on to blowing a bowl and then made a classic paperweight. It was so much fun I can’t tell you. I’ve been wanting to try ever since watching Norman Stewart Clarke and I have to say I loved every minute, I just want to do it again now! Here’s a couple of photos and a link to Rick’s Flickr account where you can see all the photos from the weekend, The Bead Fair, meals out, Bienale and our glassblowing. It’s official, I’m back in my new improved studio. I have insulation, posh lining and a pale laminate floor. I also have a new shelving unit for my glass and a new workbench (well, kitchen worktop). It all looks lovely, now I have to tidy up my jars of glass and organise some way to display and store my huge frit collection without the labels fading in the sun light. I have lots of jars to soak labels off, as I just used to use them as they were, label and all, to store glass rods in that I am using, but no more, I’m on a tidy up spree. I’ve ditched lots of rubbish that was in the old studio, including all those lovely colour wine bottles that I thought I would turn into beads. I’d love to spend the time recycling glass, but to be honest it takes too long for my style of beadmaking. I’ve got really ruthless and have decided to part with glass I won’t ever use and clear out a few bead presses also. All of yesterday was spent sorting out said rubbish and going up and down the steps between the house and garden with handfuls of things to put back in the studio. We can now see the floor in our lounge again, such a relief. Wow what a week, I was going to post earlier than today but I’ve been a bit busy, again. This week I had the pleasure of attending another course, this time with the marvellous Andrea Guarino who came over from America to teach at Creative Glass. She has now gone to Zurich to their Swiss head office to teach a couple more classes. We had a fabulous 2 days with Andrea, who showed us how to make several of her bead designs, mainly to teach the techniques she uses to alter the appearance of the simple Effetre glass palate. We learnt some reactive twistie recipes and some neat tricks for colour reactions. We also got to play with some of Jim Moores’ fabulous tools, something I’ve been intrigued by for a long time, and we loved them so much that we had to have a tool lottery to fairly decide who could buy what tool. I fortunately got second or third dibs and got the tool I was desperate to own, a large one and a half inch lentil masher. I was seen stroking this tool at some point and there is a photo of me doing this lurking on t’interweb somewhere. Andrea is great fun and a very generous teacher, and I’d thoroughly recommend going on one of her courses if the opportunity arises. The course was also made very memorable by my friends who attended it. We had a real blast, and all got on very well with each other and Andrea, the guys at Creative Glass haven’t ever heard so much laughter at one of their courses before. Unfortunately the down side of all this is that I’m rather weary again, having had 2 intense days of tuition, a late night out for a meal with the lasses and 2 days manic driving back and forth to Rochester. Oh well, it was so worth it. Today I’m catching up with stuff, listing more goodies on Etsy …. keep an eye out for new stuff during the day……and getting really stuck in to sorting my work for the Bank Gallery Exhibition that we set up in 11 days time. Oh and I have to check how my laminate floor will look when put in my studio. If you have come here via Bead Magazine welcome! and welcome also if you’ve arrived via my advert in the Making Jewellery courses supplement. I have new course vacancies on my tuition page and these are currently changing daily. I’m very pleased to be featured in Bead magazine in the ‘Makers Profile’ slot this month, and if you’ve read the article you’ll know that my objectives for this year are to direct my business to be a more web- based one. To that end we’ve been working really hard the last week to bring my web site up to date and give it a bit of a makeover. I’m very pleased with how it’s looking now. I have a lovely fresh gallery with lots of lovely photos, and an updated front page (thank you Dickie). I’ve also re-stocked my bead shop at last, the first of many re-stocks this year. I have other changes to make but I’m not going to bore you with that, it’s for me to do and you to find when I’ve done it! I’ve also been very busy this week getting ready for the bead fair at Ardingly this Sunday. I will have my usual mix of colourful beads, some new silver chains suitable for my Cloud Beads and I’m having a bit of a spring clear out so will have some reduced price sets and of course I’m refilling my popular bargain pots. Do come and say hello. Oh dear, I’m really slacking on the blogging front at the moment. It doesn’t help that I can’t move my laptop from the desk, it seems to have turned into a desktop machine, as it crashes when I try to move it. I do need a new laptop, and I’m very disappointed that the journey to buy a new one is frankly rather boring…and I’m not talking about the drive from Horsham to Crawley. I’d been thinking for years that getting a new one would be so exciting, but alas, after a small amount of research it looks like I’ll be going with the same make of Acer again, in a boring colour. I’ve been watching all the Dell ads on telly, and have browsed their website, I’ve even fallen for one of the wacky patterns…this one…Horizontel del Infinto but honestly don’t see the point in paying an extra £75 for a pretty pattern….this is the engineer and tight wad in me! Although a quick look at the website whilst putting this link in would make it look as though the pattern is free at the moment…no I just checked it’s an extra £89! forget that. That aside, they don’t seem to have what I need for a price to match the Acer. rats. Also I’ve left it so long now that I think I may have a mercy mission this week to rush and buy a new one, rather than waiting for a custom job. ho hum. This week I’m getting ready for another show, or rather a month long exhibition. This is with the Surrey Guild, and we’re setting up this Friday. The event is a selling exhibition at Guildford House Gallery in Guildford High street, and opens this Saturday, running until Christmas Eve. After that I am preparing for another Surrey Guild Exhibition at the Bank Gallery in Chobham. Then it’s prep for the 2 school craft fairs I’m attending. So it’s all go at the moment. Fortunately (or rather unfortunately) I didn’t sell much at the fair the other week, and so have lots of pieces made already for the Guildford show, but I do have to re-label everything and do my inventory sheets (joy of joys! )…let’s hope the laptop copes. Procrastination rules again. Today was my day to go to my jewellery class, but due to unforeseen circumstances I am at home with my daughter who is on her last inset day of the half term. I should be busy making jewellery for my private craft fair on Thursday, but oops, look, here I am, getting distracted by t’internet. What’s a girl to do? So I’ve been looking at a thread on Frit Happens about Etsy, teams and treasuries. Now I stupidly opened an Etsy account in a rush (several months ago) to buy something from someone on there, and didn’t realise until it was too late that my account name sets my shop name. Rats. I really don’t want to go by the name Silverlemon anymore, at least not for my sales. So I feel like I have shot my self in the foot really. 1 week and counting until Horsham Open Houses, eek. This Horsham event starts next Saturday and obviously I will need to have my work set up by next Friday, so eeeeeek. I did start making beads for this months ago, but still feel the need to make specific designs and sizes to make the collection of jewellery that I have envisaged in my head. I also have to go and collect my exhibition pieces including my Transition necklace, that were on display in the Bank Gallery, Chobham, so I have something really special to display. I have all my headpins made and pickled and need to tumble polish these before I can use them, and I have a very boring job of making my own style earwires over a few evenings too. Thankfully I can make up the earrings without these then pop them on when they’re all done. I’ve also decided to make a display of my silver cored beads, and I’m working hard to make extra for this event and for Winchester also….I haven’t added this to my events page yet, but it’s the Contemporary Craft Fair in a marquee at Winchester Cathedral that I did 2 years ago with the Surrey Guild. I announced in my news section on the home page that my Transition necklace image was used this year for the front cover of the Open Houses brochure….well this is now plastered all over Horsham town Centre, with lots of laminated notices around the town to advertise the event, woo hoo. I thought I’d be more excited but actually I’m not, lol. I’m hoping to see them on all the lamp posts around town too if they put these up again this year. I’ve just added a link to the Open Studios web page, and it’s there too! Hi ya! It’s happened again, 2 weeks almost have passed and I haven’t been in to say hello! So here I am, and what’s been happening in Sarah’s world? Quite a lot but I’m not going to bore you with lists of what I’ve been doing, as much as I love lists. What I will say is that after all the glass beadmaking tuition I was doing, that we managed to go camping with our little caravan (oh the shame) at Whitsun, which also means that we now have our long awaited car…at last…and it has enough wellie to tow…which was why we had to wait so long for the right car in the first place. Half term has come and gone, and we attended a lovely family wedding last Tuesday of all days, well it was half term and after a bank holiday, so it seemed kind of right. We had the new bead fair at Dorking Halls this Sunday gone, and true to form it was sweltering hot, just like the old days when we used to have a shared GBUK stall when I first started beadmaking and selling my handmade glass beads. I was even in the same room out of the 3 there that we used to be in. So a big hello to everyone who came to say hello on Sunday and I hope you enjoy using the beads you bought. This week I’ve started preparing in ernest for the Horsham Open Houses, 20th, 21st June and 27th, 28th June. We’re a month earlier than previous years which is really good as we won’t be clashing with all the summer events like Wimbledon and Hampton Court Flower Show and other fun stuff, so hopefully the number of visitors should be up. This has confused me somewhat though , as I keep thinking I have loads of time to prepare when I haven’t. I may even trot off now to make some beads, rather than making up some jewellery…. I’m also really pleased to have my transition bead necklace on the front cover of the guide this year! I love my new studio! I can’t get over how spacious it feels inside, you could really swing a cat in there (apologies to all cat lovers), whereas the last one you could pick up a mouse but not even swing it…not that there were any mice in there of course. I have 2 workspaces set up in a sort of minimal way, and I’m determined to keep it as clear as I can until we start lining the walls, however I don’t seem to be succeeding. I keep needing more things to be able to work, ‘oh just that tool’ and ‘I really want to try that glass I bought at the Flame Off‘. What’s a girl to do? All that scrumptious new glass and lovely new colours from CIM, I’m aching to try CIM Sapphire and Cornflower and TAG Taxco Silver Turquoise. OH dear, I’m going to have to take the rest of my box of goodies down to the studio today and start using it, I can always stash it in one of the wire drawers I have. I really don’t know where the last 2 months have gone, well I do, but didn’t get the jobs done that I’d hoped to, as I thought I’d have loads of time to update my website, write tutorials and generally tart things up a bit. But taking down the studio and preparing for the new one took all my energies and thoughts, I suppose I thought that may be the case, but had hoped that I’d be able to take advantage of the time and sort some indoor jobs. But I’m not going to beat myself up about it, I have a huge new studio and can make handmade glass beads again, which is bliss. I also started my glass beadmaking courses again last week, and have a couple of days this week and several dates to look forward to throughout June. Anyway, enough of my wittering, I need to get my kiln on and get making beadies for the Bead Fair at Dorking Halls on 31st May. Where did the Easter holiday go? Why am I sooooo tired? Why am I skint? Why is there a huge pile of washing up in the kitchen, you know, all the posh stuff you don’t want to ruin in the dishwasher? Why are there masses of glass jars and bits all over the lounge floor? and who left that shed in pieces around the side of the house? OK, so here’s the plot, Monday before Easter we emptied my studio, that took longer than I thought it would, even with my packing things and tidying stuff away the week beforehand. Late Monday afternoon Rick removed the benches, power and stuff screwed to the walls. Tuesday we took the shed apart and carted it around the side of the house, this was very enjoyable as there was no way I could have done that for the last 10 or so years previous. Then Rick started excavating the plot to lay the next 12 slabs we needed, including digging out the pesky Virginia Creeper shoots and ivy plants everywhere. We managed to fill 2 of those Hippo bags you can get from builders merchants with the soil from the slope, which didn’t look particularly slopey until he started digging of course. Then he had to lug 12 bags of sand, 12 huge slabs, move the 2 heavy sleepers that were holding back the lawn, then move them 3 or 4 more times as they kept gettong in the way. After the slabs were laid we started repairing the surrounding fences, and removed 2 panels from the back of our garden so that we have slightly more room to walk along the back of the new studio to remove leaves and stuff. The panel removal revealed a huge tangle of more Virginia Creeper, which all had to be prised off the fence and chopped to fill the recycling bags, and the huge root dug up and disposed of. I also went around the garden and pulled out all the brown long leaves from the Crocosmia and grasses around the place, cut back the Pyrocantha and the Fatsia Japonica to reveal the Hellibores we planted last spring, and generally got rid of the plant rubbish. I then attacked the front garden border and had several subsequent trips to the dump, which in itself was entertaining as the bags were so heavy I had to drag them, then pull individual handfuls of plant bits into the skips until the bag was light enough to pick up and tip the contents away. Phew. Oh and we also had 2 trips down to look at cars, one of them to buy a car we wanted and had rung up to check it was still there, only to be told casually ‘Oh we sold that one yesterday’ when we got there. Typical. That’s the progress so far, we now have to finish repairing the fences, paint them, and decide how many new sleepers and slabs we need to complete the area around the studio and the path down to it. I also need to organise the insulating materials, the internal cladding, the flooring, the ventilation and what benches I want. I’m also trying to choose a couple of lovely garden shades to paint the shed when it’s been up for a while. That’s all the good news, the bad news is that I’ve been let down on when the studio is being delivered, which is after I was supposed to be starting teaching again. This is very annoying and stressful because I now have almost 3 weeks without a studio, the time slot that I had planned for fitting out my studio perfectly, and now we have to make it just ‘OK’ to start teaching on time, and that’s with having had to rearrange a couple of students to come in June instead now. Of course even OK will be plenty to actually teach properly, it just won’t be fixed up permanently and decorated. As far as the rest of the holiday and my tireness, that’s probably down to going away to the Flame Off last Friday and Saturday, but thats another post! So much is happening at the moment, I don’t seem to be able to squeeze in blog time. 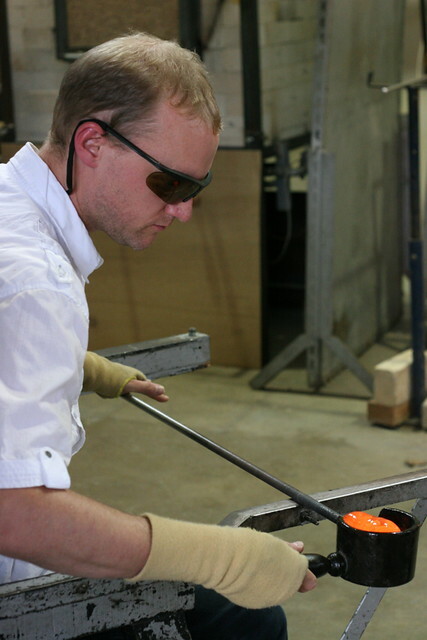 I went on a fabby course this weekend gone, at Creative Glass in Medway, Kent. We were tutored by Gail Crossman Moore, a renowned glass artist who works mainly in borosilicate glass, and so the course was all about this type of glass, one that I haven’t even dared try to use before. It was very informative and lots of fun, especially as we turned out to be a very small select group of 5 including Gail, 2 students having bailed out just prior to the course. Gail gave us a really solid grounding in using boro, teaching us about the metals used to make the colours, and good colour combinations, and how to vary the effects. We also had the added bonus of making a felt bead, that was fun. I feel so fired up by what I’ve done, and can’t wait to get my beads that I had to leave there from the second day. I was also very pleased that we all went out for dinner on the Saturday evening (this is something that doesn’t normally happen unfortunately) and the added bonus was Rick and our daughter being with us too as they’d driven to Kent to collect me (still only 1 car). The only down side is that I now am bursting to go and try what I’ve learnt and can’t because we dismantled my studio yesterday. Oh yes, it’s all in pieces, and all my equipment is in the garage or scattered around the lounge floor. Oh it’s fun to be back in chaos in our house again, not, but it is worth the mess and disruption. It’s amazing how little I can actually do when Rick is working on a project. I seem to spend my whole time troubleshooting and running around buying things we need, or brewing endless mugs of tea, preparing lunch and cooking dinner. I still haven’t managed to do the washing up, but I did actually order a washing machine last night, so that’s another good and necesary job done, just the car to find now! and all the mini problems of landscaping the garden to solve to accomodate the new shed. New Beads for sale & I’m published! New beads are in my shop! I know, only one month after the last restock, that’s very good going for me, you see I can stick to my new year resolutions if I try. There’s a taster below to tempt you, so go shopping in my bead shop and grab yourselves your favourites before they go! Ooooh, I nearly forgot, 2 more bits of news, firstly The Tempest Exhibition has started touring Europe, and is at Creative Glass in Zurich until 29th March, with further venues to be announced. Ten new artists work has been added and a new catalogue with these extra photos has been produced. Second bit of news and the most exciting is that at last I have some beads published in one of the new Bead magazines available from newsagents and bead shops. The photo is my entry that I was designing last December for the competition in Beads & Beyond, and I’m really pleased to have it shown on Page 62 of the current April issue. I really don’t care if I win or not, although it would be nice to win, but my main reason for entering was to help increase awareness of our British Handmade Glass Beads, and also hopefully have my set in print and get a bit of free advertising, which it is, so woo hoo. It’s back to normality again, at least kind of, because I have my daughter here on an inset day, and I only found out about that by chance after a party she went to yesterday. If it hadn’t been for my friend saying ‘oh you do know it’s an inset day tomorrow’, my poor daughter would have been walking up the school path on her own,wondering where on earth everyone else was, ha ha. I had all sorts of things planned for today, well, I say that, but I was planning to make my weekly 90 beads today, but I’m not really ready, well, I should really say that the studio isn’t, I have to tidy it and remove the 2 spare kilns from the floor and anything else that was shoved there out of the way on Christmas day so we could sit down on chairs instead of kilns to have our festive lunch! I expect there aren’t any mandrels ready either, I think I’ll bring those indoors to dip and dry because it’s a bit white outside with thin patches of snow. There’s nothing more frustrating than going to make beads and finding you have to spend an hour tidying up first. So we’re having a nice quiet day together today, just me and my daughter, as Rick is back to work after a 2 week break. I may just make the effort to take her into town and get her feet checked while all the other kids are in school, that will save queuing. Of course this month is also my dreaded month of catching up with my accounts and doing my tax, oh joy of joys. I always dread it but enjoy it when I get going, I just have a real problem making a regular slot to do my bookeeping, there’s always something more urgent needs doing. We were planning to replace the studio this month with a much larger version while I’m indoors doing my accounts, but discussions with the shed suppliers have revealed that I’ll need a concrete base to support the new size and of course it’s been very frosty this winter, so we’re rescheduling this for the Easter break. Also this month is the Beadworks bead fair at Ardingly on the 25th January, so I’ll have to punctuate the month with bead making sessions, what a pity..lol. I’m planning to make more Double Helix beads for sale at this fair, using my new found silvered glass skills, yipee, I can’t wait to get out there and play.